Aulus Vitellius Germanicus was a Roman Emperor from April 1769 till December 22, 69, one of the emperors belonging to the Year of the four emperors. Close the Emperor Caligula, Claudius and Nero, he was consul in 48, governor (proconsul) of Africa (61). Vitellius is named by Galba on December 68 as governor of Lower Germany. Proclaimed emperor by the legions in the provinces that revolted against Galba (1 Jan 69), Vitellius sends his troops in Italy. At Bedriacum (April 14, 69), near Cremona, his legions achive victory over Otho (proclaimed emperor on January 15, 69 after the assassination of Galba), four days later Vitellius is recognized by the Senate. After the proclamation of Vespasian as emperor on 1 July 69 by legions of the East, overtaken by events, Vitellius remains inactive in Rome. He is killed on 20 December 69 in Rome during the streets rebellion against Vespasian's forces. 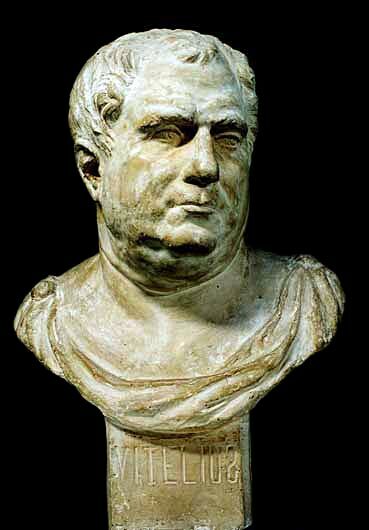 This work presents an antique bust known as Vitellius, mature man with a round face and thick neck, his head slightly turned to the left shoulder. He has short hair, slightly curled, combed back. Wears a toga caught in folds, with round fibers. For this "antique bust" ,made after a mold found in the classroom, Brancusi received an "honorary mention", the work being performed in the first weeks of attendance at the National School of Fine Arts in Bucharest. But it is not a mere copy of a classic mold, but a real psychological portrait.